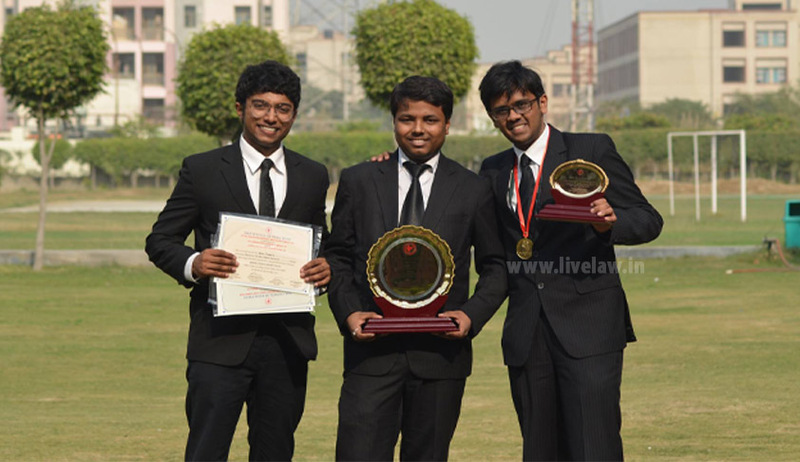 Arpit Singhvi (Speaker 1), Ronith Joy (Speaker 2) & Vaibhav Kumar (Researcher) of Institute of Law, Nirma University are the winner of the 30th Bar Council of India Trust National Moot Court Competition, 2014. The Moot Court competition held on 7th to 9th November, 2014 at Lloyd Law College, Greater Noida. Live Law: Firstly, congratulations on your victory! What was the overall experience like? Team: Thank you so much. Last one month has been absolutely fantastic. Though the journey has been tiresome but we would say it was work along with fun. Since the level of competition was very high so we had to be on our toes throughout the preparation and oral rounds. Live Law: How was the process of preparation for this competition? What was your mantra to victory? Team: Our main focus while preparing for this competition was to break the problem based on facts and to defend the case logically. We believe that if you are able to defend a case logically then there will be some or the other law backing that logic. So once we were through with the facts in and out we supported out arguments based on legal provisions and precedents. This was the distinguishing factor for us that we were able to relate our case with all the legal backings we had. Mantra for any success is cumulative effort of belief along with consistent and intense hard work. Live Law: What was your best moment as a team in the moot court competition? Team: The best moment as a team was qualifying for semifinals with highest marks. We had a tough time to satisfy the judges on point of law in quarterfinals. So we were very skeptical for making it to semis. Only 4 teams out of 16 were supposed to move to semis. To our surprise we were ranked first for making it to semifinal rounds. Live Law: What do you think were the hardest moments that you guys faced as a team? How did you overcome the challenges? Team: The hardest moments were the quarterfinal rounds against the defending champions i.e. KIIT University. We had a tough grilling in that round which was presided over by designated senior counsels of High Court of Delhi. Once again our team USP of being clear on facts in and out and relating it to all the cases laws which we had refereed helped us clear that round and satisfy the queries posted by the judges. Live Law: Who did you consider to be your toughest opponent in the moot court competition? Team: We feel that NALSAR were the toughest opponent. They were very well prepared and legal backings on all the argument that they made. Live Law: Could you give us an insight on the last round? How was it? Team: The last round was presided over by five sitting High Court Judges. It was an amazing round. We were against NALSAR, Hyderabad and we both were well prepared on facts and legal points. Our concept on law was very clear and that might have given us the deciding edge over them. Live Law: Could you share a few pointers on mooting, for the young and upcoming mooters? Team: One mistake we usually see being regularly committed by upcoming mooters is remembering the memorials and arguments advanced. Oral presentation is all about discussing the case with judges. One should be conceptually clear on what is the position of law and should be able to relate it with the facts of his case. Live Law: Team work, preparation and hard work are three cornerstones to mooting. Do you think there is something that can be added to these? Do share your insights. Team: Team work is based on the compatibility among the team members. One should be very careful while making a team for a moot court competition. Apart from preparation and hard work there are other important things as well to win a National Competition. Mantra for any success is cumulative effort of belief along with consistent and intense hard work. All that we achieved was a product of our belief that we are going to win this competition. Since this is the first time that a team from Gujarat has won BCI Trust National Moot Court Competition, it was very important for us to have belief in ourselves that we can win this competition. Once we had this firm and unshakable belief, other things got in place. In fact the name of the WhatsApp group which we used to keep ourselves updated about the progress of research work was “Jeetne aye hai...Jeet k Jayenge”. We believe that to make a dream come true just being consistent at your work won’t suffice. Just making it sure that you are working throughout the month doesn’t guarantee you a win. See there are others working too. This is a competition and every team is giving it their best shot. So a consistent effort which was used by a team to gain some leverage, now becomes an average. Here comes the effect of intensity. The amount of intensity put in by a team in their preparation gives them some leverage above others. So a consistent intensified effort for a month is required to win any competition. Live Law: What etiquette does a mooter have to follow during a moot court competition? And why do you think it is important? Team: Mooter should be conceptually clear on the points of law related to his case. He should be a versatile speaker. There are times when based on the type of judges in your oral rounds one has to be aggressive or submissive. So a mooter should always be prepared for adjusting his speaking style based on the judges his team faces. Apart from this mannerism and time management plays a major role in moot court competitions. Usually we tried to present our case on half of the time allotted to us for oral rounds because it usually happens that most of the time is taken by judges in asking questions. So a mooter should target to complete his arguments in half of the time allotted to him. Hope these tips would help the upcoming mooters to win various competitions. We wish them all the best. Well thank you so much for your time team and such an early response. We wish you all the best you future.